← You are cordially invited…..
My grandchildren come to lunch on Wednesdays. Their school is close by and they hurry through the back lanes, let themselves in through the garden gate and run up the kitchen steps. They know there will always be a table set and something a little special for lunch. They have more than an hour so we always have time for play or reading. Today was special. They arrived at 11:45 so the ceremonies at the Cenotaph in Ottawa were just winding up and the march-past was going to begin. To their astonishment, I had devised a makeshift table out of book cartons covered with a table cloth and lunch was served in front of the TV..unheard of. They had lots of questions about the Governor General. They recognized our new Prime Minister and his wife. They were genuinely interested in what they were seeing. I thought it was a once-a-year opportunity to talk about …about what? War, soldiers, our country. I had prepared a copy of “In Flanders Fields” for each of them. We read it and talked about it. 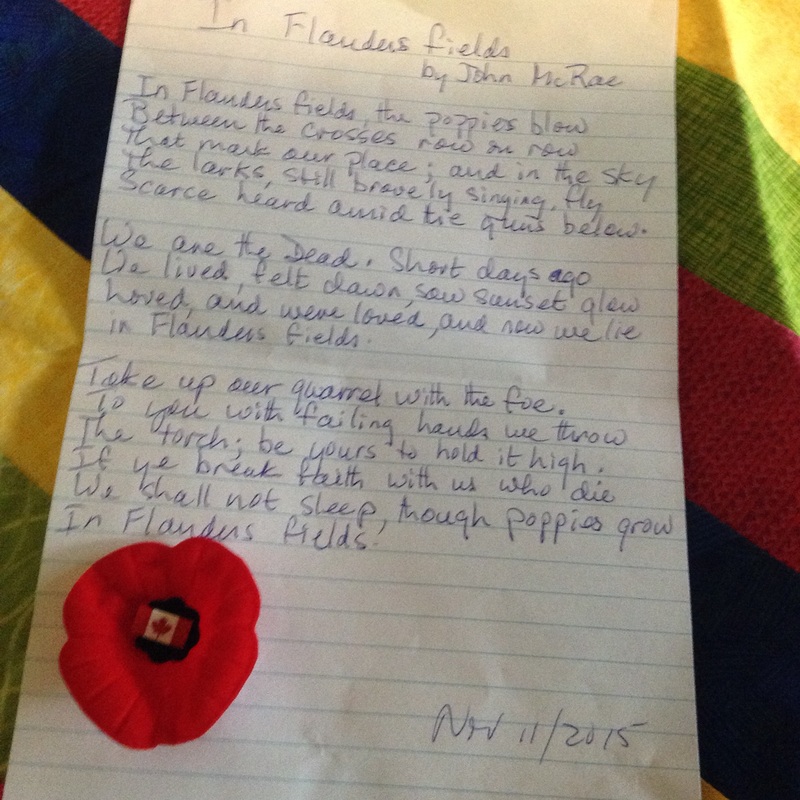 My oldest grandchild, a very lovely boy of 11 told me they had studied the poem the day before in English class. He said his favorite part was “Loved and were loved” I was surprised that my middle grandchild found it ” creepy” but I could see his point of view too. Dead people watching and telling us they’ll haunt us if we don’t go on fighting. It struck him as scary somehow. These days we tell kids they should never fight, and rightly so. The only way I could put a positive spin on it was to take the example of a bully picking on a weaker kid. We’d have to ” take up our quarrel” then, wouldn’t we? It was a very thoughtful conversation. They got the idea of fighting against dictators too. Fresh from the Federal elections, I guess. After lunch we walked back to the school together in the mild November sunshine. I saw my granddaughter standing a little way off from her classmates, not joining in until the bell rang and I wondered what she was thinking. What a special way to remember, through the eyes of our children!